Have you ever looked carefully at the Alstroemeria? With its twisted leaves and beautiful brightly coloured flowers it really is a feast for the eye. Botanical artist Pierre-Joseph Redouté certainly thought so: his picture of the Alstroemeria peligrina is considered one of his masterpieces. Pierre-Joseph Redouté (1759 – 1840) was one of the world's best botanical artists. He was born into a family of painters, and it was therefore natural that Pierre-Joseph would also learn the trade. In 1782 he and his brother travelled to Paris, where they painted scenery for the Théâtre Italien. But in his spare time Redouté preferred to paint flowers. Through friends of friends he came into contact with Charles-Louis L'Heritier, an amateur botanist and writer. He gave Redouté a full-time job as an illustrator, and taught him botanical anatomy. That knowledge later made him unique, because Redouté's extensive scientific knowledge meant he was able to paint plants and flowers down to the smallest detail like no other. His greatest fame came from his paintings of flowers in the garden of Malmaison, the Castle of Napoleon I and his wife. Redouté was also Marie Antoinette's official court painter. He painted plants from her garden for her. Apart from his role as a painter, Redouté was also important to science. He produced more than 2,100 drawings of 1,800 different types of plant, many of them unknown until then. His books Les liliacées and Les roses are highlights of botanical history. His watercolours of elegant bouquets also made him the darling of the Parisian elite. 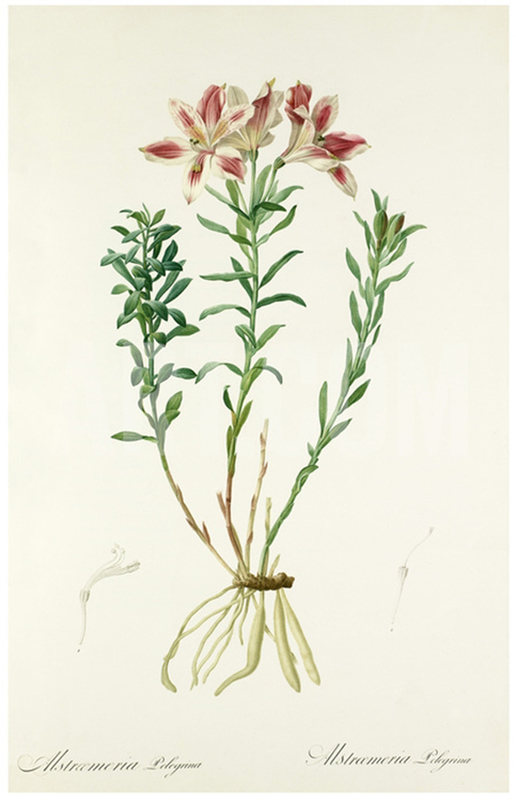 He also produced the remarkable illustration of the Alstroemeria peligrina shown here. Experts say that this illustration shows Redouté at his best. It combines his finest artistic skills with his unique ability as an observer of nature. We certainly think it's fabulous. How about you? We can tell you lots more about botanical prints. If you want to find out more read further here.